The Florida Panthers last qualified for the Stanley Cup Playoffs in 2000 when Pavel Bure was the team's leading scorer. The last time the club celebrated a postseason victory was three seasons earlier, John Vanbiesbrouck was starring in net. Panthers General Manager Jacques Martin is optimistic his team can snap the playoff jinx this season, particularly after the hire of new head coach Peter DeBoer as his successor on June 13 and the rebuilding of a defense that ranked 29th in the League in shots allowed per game (33.6). The Panthers finished third in the Southeast Division in 2007-08 with a 38-35-9 record, which, by the way, was their highest win total in seven seasons. DeBoer was a two-time Coach of the Year in the Ontario Hockey League with the Kitchener Rangers and a Memorial Cup winner. What Martin likes best about his coach is his hard-nosed, no-nonsense approach to the game. "Peter is an individual who is demanding, but fair, and who has good communication skills," Martin said. "He's an individual with a good hockey mind, runs a good bench, and, to me, is a perfect fit for our hockey club. He brings some intensity and some discipline." After selecting his coach, Martin went to work on the roster, dealing captain and leading scorer Olli Jokinen to Phoenix for defensemen Keith Ballard and Nick Boynton at the 2008 Entry Draft on June 20. He then signed wing Cory Stillman to a three-year deal in free agency and re-signed defenseman Jay Bouwmeester to a one-year contract on July 28. "The one area we wanted to address was our defense, and I think we did that at the draft with the trade (for Ballard and Boynton) and then getting Jay (Bouwmeester) signed to a one-year deal and not needing to go to arbitration," Martin said. The Panthers also acquired veteran defenseman Bryan McCabe and a draft pick from the Maple Leafs in exchange for defenseman Mike Van Ryn. "I'm excited about coming (to Florida)," McCabe said. "There's a great group of young guys here and a good mix of talent. Bringing in Cory Stillman, a guy with two Stanley Cups, and the acquisitions of (Keith) Ballard and (Nick) Boynton is a big upside. With myself added, and Jay Bouwmeester, who is one of the best defensemen in the league, hands down, I think we have one of the best defensive units out there. 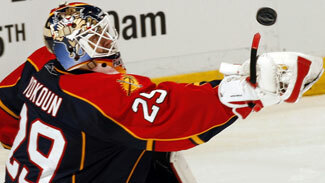 Plus you have an All-Star goalie (Tomas Vokoun)." Tomas Vokoun certainly held his own in his first season with the Panthers, considering he was forced to handle a League-leading 2,213 shots in 2007-08. The nine-season veteran, who was forced to the sideline after suffering back spasms toward the end of the campaign, posted a 30-29-8 mark with a 2.68 goals-against average and four shutouts. His .919 save percentage ranked 11th in the League and his 69 appearances ranked eighth. Vokoun had to be smiling from ear-to-ear watching the transformation along the Florida blue line this summer. His impressive career totals, taking into account an eight-season stint with the Nashville Predators, include 191 victories, 25 shutouts, a 2.57 GAA and .914 save percentage in 453 games. An upgrade on defense will only help boost the 32-year-old goalie's confidence. The backup, 27-year-old Craig Anderson, made 17 appearances with the big club last season and finished 8-6-1 with a 2.25 GAA, two shutouts and impressive .935 save percentage. Additionally, the club has 2005 second-round draft pick Tyler Plante and 2008 second-round choice Jacob Markstrom, the No. 1-rated European goalie according to NHL Central Scouting, waiting in the wings. Bouwmeester (6-foot-4, 212 pounds), who led all Florida defensemen in goals (15), assists (22) and points (37), should receive additional support this season with the acquisitions of Ballard and Boynton. The duo combined for 33 points, but it was their physical presence in the back end that certainly benefited Phoenix in 2007-08. Ballard, a first-round pick of the Buffalo Sabres in 2002, had 34 takeaways, 169 hits and 162 blocked shots while Boynton, a first-round pick of the Boston Bruins in 1999, had 93 hits and 93 blocked shots. "I really believe our defense is much stronger, much better at moving the puck, but also much more physical and nasty to play against versus last year," Martin said. "We definitely have more experience back there. Jay (Bouwmeester) has played an important role on our team over the last five seasons, logging significant ice time while contributing at both ends of the ice. Adding Ballard, a No. 2 defenseman, and Boynton, an experienced guy, really helps us. And the fact Tomas (Vokoun) has been here a year now, and Craig Anderson is here, makes our goaltending very solid." McCabe played for the Islanders, Vancouver and Chicago before being traded to Toronto in 2000 in exchange for former Florida defenseman Alexander Karpovtsev. He scored 5 goals, 18 assists, 109 hits and 96 blocked shots in a career-low 54 games last season. McCabe missed six games early in the season because of a groin injury, then two months after breaking three bones in his left hand when he was checked into the boards during a loss at Montreal on Feb. 7. Still, he led Toronto in total minutes (25:55) and shorthanded minutes (3:36) per game while logging over 4:30 of ice time on the power-play. DeBoer will also look to Bryan Allen, who led the team's defense with 112 hits and 119 blocks, along with Cory Murphy (17 points in 47 games), Noah Welch and Karlis Skrastins to fill out the rotation on defense. Don't be surprised if defensive prospect Keaton Ellerby, a first-round pick (No. 10 overall) in 2007, also earns some minutes with the big club this season. Stillman, who signed a three-year deal on July 1, will provide the Panthers needed experience and support on the power play. The 34-year-old wing scored 11 goals with the man advantage while splitting time with Carolina and Ottawa last season. In 79 games, Stillman, who has scored at least 20 goals in eight of the past 10 years, had 24 goals and 65 points in 2007-08. "Up front, the acquisition of Stillman will bring some leadership, experience and a winning attitude, since he won the Cup in Carolina (2006) and Tampa (2004)," Martin said. "I think he'll fit right in with our kids." Martin has high expectations for many of Florida's younger players, including Nathan Horton, 23, Stephen Weiss, 25, Rostislav Olesz, 22, David Booth, 23, and Greg Campbell, 24. Horton, Florida's first-round pick (No. 3 overall) in 2003, has posted back-to-back 62-point seasons, including 27 goals and a career-high 35 assists in 2007-08. In four NHL seasons, the 6-foot-2, 229-pound wing has scored 100 goals in 293 games. Richard Zednik, who has 346 points in 675 career games, and Brett McLean, who has 143 points in 305 games, will be looked upon to provide some leadership and stability up front. Weiss was third on the team in scoring with 42 points, followed by Booth (40 points), McLean (37 points), Zednik (26) and Olesz (26). Booth led the team with six game-winning goals and had 113 hits last season, Campbell (18) topped the club with two shorthanded goals and 156 hits and Horton was second behind the since-departed Olli Jokinen with nine power-play goals. Those players will certainly be pushed by budding prospects like Shawn Matthias, who might very well be centering one of the top two lines out of training camp, Anthony Stewart and the Czech duo of Michael Frolik and Michal Repik. DeBoer is also hopeful forwards Stefan Meyer and David Brine, who each played a handful of games with Florida last season, can establish themselves even more in 2008-09. "Having a familiarity with a lot of the young players, from Nathan Horton to Stephen Weiss, from Gregory Campbell to Brett McLean, was one of the reasons I felt this job was the right fit," DeBoer said. "I saw it as a team with upside, and it's going to be my job and the staff's job to realize that upside." * Peter DeBoer, the 10th head coach in Panthers history, brings with him a renewed passion and energy to the position. The 40-year-old coach is a proven winner and, despite entering his first season with the Panthers, is familiar with several of the young players whom he previously coached. "He's tough and demanding but extremely fair," forward Stephen Weiss said. Weiss played with the Plymouth Whalers in the Ontario Hockey League when DeBoer was coach. "These guys are sick of not playing playoff hockey," DeBoer said. "They all want to be playing meaningful games in March, April and May, and they're going to do whatever they have to do to make sure we're in a competitive situation to do that." * The Panthers' defense has the potential to be one of the strongest in the Southeast Division with McCabe, Ballard, Boynton, Bouwmeester and Bryan Allen manning the blue line in front of veteran goalie Tomas Vokoun. The club finished 14th in the League in 2007-08, allowing 2.68 goals per game, and expects to improve on that mark with the upgrades made in the offseason. * While the loss of center Olli Jokinen hurts, it could open the door for prospect-in-waiting Shawn Matthias, who was originally drafted by the Detroit Red Wings in the second round in 2006 and came to the Panthers at the 2007 trade deadline in exchange for Todd Bertuzzi. Matthias, 20, played a part in Team Canada's gold-medal winning performance at the 2008 World Junior Championships with three goals and one assist. In just his second of four NHL games with Florida last season, Matthias scored a pair of goals and earned 25 shifts. He's also coming off two great seasons with the Belleville Bulls in the OHL, posting 73 points in 64 games in 2006-07 and 32 goals and 79 points in 53 appearances this past season. The versatile Matthias, who could also play wing, might just be the second-best option at center after Weiss.